Welcome to Prehistoric Beast of the Week! (Formerly known as Prehistoric Animal of the Week) This week we shall be reviewing a dinosaur that, next to Tyrannosaurus, is one of the most iconic in history. Make way for Brontosaurus excelsus! Brontosaurus was a heavily-built sauropod dinosaur that lived in what is now the Western United States during the Late Jurassic Period, about 152 million years ago. It would have eaten plants and as an adult, measured about seventy two feet from snout to tail. (Although there is evidence that it could have grown even larger than that.) The name Brontosaurus, translates to "Thunder Lizard/Reptile" in reference to the animal's immense mass, and how it must have sounded like thunder when it walked. 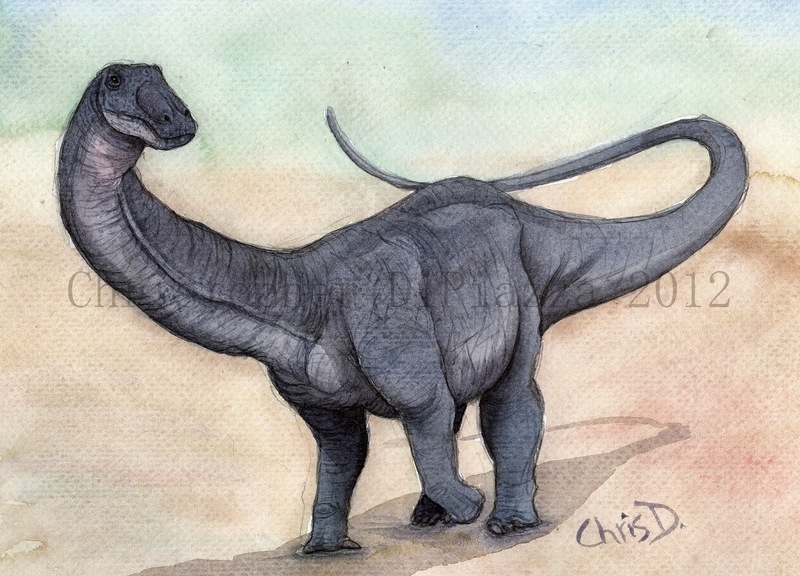 Life reconstruction of Brontosaurus exelsus, by Christopher DiPiazza. Brontosaurus has one of the most interesting histories behind its discovery and naming in all of paleontology. Back in the late 1800s, Brontosaurus was discovered alongside many other dinosaurs within several year's time, including another sauropod, known as Apatosaurus. At first, the skulls from neither of these dinosaurs were known so they were given reconstructed heads based on closest related dinosaur they knew of at the time, Camarasaurus, for their museum mounts. Soon after, Brontosaurus and Apatosaurus were discovered to be too similar to warrant different genus names, so the name Brontosaurus was done away with and was lumped into the same genus with Apatosaurus, becoming Apatosaurus excelsus. (This was because Apatosaurus was named first.) Plus, a skull for Apatosaurus also was finally discovered (which was quite different from that of Camarasaurus) further pushing Brontosaurus deeper into the realm of nonexistence, and that's the way it stayed for about one hundred years. Despite this, the name, Brontosaurus, had become so popular that people even during modern times still mistakenly use the presumed dead genus name to to refer to the iconic long-necked dinosaur. (Let's face it, "Thunder Lizard" is a cool name.) This would drive paleontologists and other knowledgeable people insane, constantly correcting people for using the outdated name and then in turn being called a "nerd" for correcting them in the first place ...until now. Original, outdated, Brontosaurus skeletal mount with a Camarasaurus skull. Frankenstein Dinosaur! A very recent study, by paleontologists, Emanuel Tschopp, Octavio Mateus, and Roger B.J. Benson, went back and looked at every bit of Apatosaurus, and the other members of its family, called diplidocidae, again more carefully since paleontologists have found many more specimens of them since the 1800s. As it turns out, the bones originally called Brontosaurus, were consistently not so similar from those of Apatosaurus after all, especially in the shape of the vertebrae and hips. In fact, they were different enough to be considered a separate genus. Brontosaurus got its name back! Brontosaurus excelsus on display at the Yale Peabody Museum. Check out how thick the neck vertebrae are! The realization that the variety of sauropods during the late Jurassic was more expansive than originally thought raises more questions, however. The environment back then was crawling (or should I say thundering?) with sauropods. In addition to Apatosaurus and Brontosaurus, there was also the taller Brachiosaurus, the longer Barosaurus and Diplodocus, and of course there was Camarasaurus, just to name a few. Something had to be special about that environment in order to support so many gigantic, long-necked plant eaters. Perhaps they each preferred different kinds of plants to eat? Maybe they migrated through different areas of the continent at different times and were never in each others way competing for food and space? We still don't know for sure. What we do know is that the Late Jurassic in North America was a definite hot spot for giant bodied, long-necked dinosaurs and Brontosaurus was one of them. Gilmore, C.W. (February 1936). 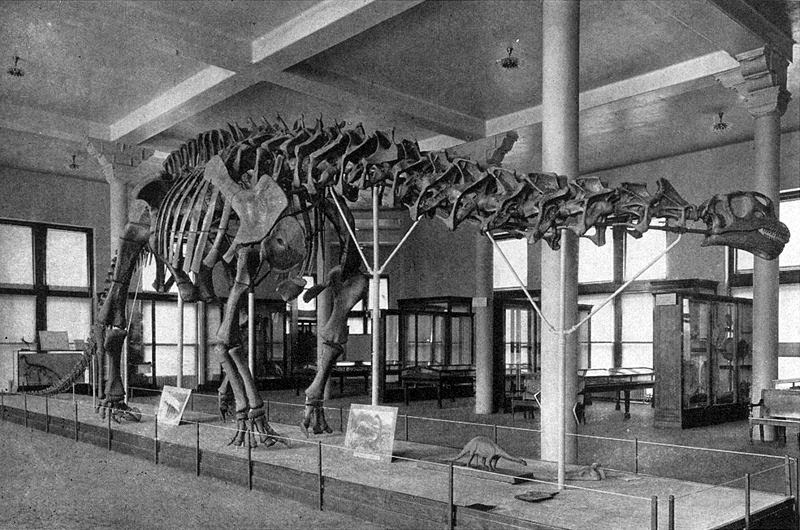 "Osteology of Apatosaurus, with special references to specimens in the Carnegie Museum". Memoirs of the Carnegie Museum 11 (4): 1–136. OCLC 16777126. Riggs, E.S. (August 1903). "Structure and Relationships of Opisthocoelian Dinosaurs. Part I, Apatosaurus Marsh". Publications of the Field Columbian Museum Geographical Series 2 (4): 165–196. OCLC 494478078. Tschopp, E.; Mateus, O. V.; Benson, R. B. J. (2015). "A specimen-level phylogenetic analysis and taxonomic revision of Diplodocidae (Dinosauria, Sauropoda)". PeerJ 3: e857. doi:10.7717/peerj.857. I am going back to the older weekly animals and giving them facelifts. Apatosaurus is next on the list. (with a brand new painting since my original shown here was based off excelsus) I will be reintroducing them as new Beasts of the Week as time goes on. Great post! The Brontosaurus painting is awesome! I was wondering if I could feature it on my blog? I would provide links to this website as well as any others you want me to.